BANFF, ALBERTA – Canada – Whether you’re traveling to Banff, Canada for a skiing holiday, a romantic wedding, or a good old-fashioned family vacation, accommodations in Banff National Park have it all. From beautiful chalets to rustic lodges, you’re sure to find what you’re looking for during your vacation to Banff, Alberta. Check out some of the Banff area’s top-tier hotels below, but remember—places to stay in the Canadian Rockies fill up fast. Banff is especially popular, receiving more than 4.5 million visitors every year. If you’re looking to travel to Alberta, book now. The seasonal rush is usually from June to September, followed by a second wave for the ski season. While you’re planning your trip, be sure to check out any accommodations your hotel has to offer in the way of ski packages, family trips, and weddings. Realize the mountain getaway you’ve been longing for at our Jasper hotel, nestled in the awe-inspiring Catacomb Mountains. 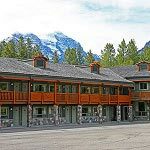 Uniquely located in the heart of Canada’s Jasper National Park, 53km south of downtown Jasper, Sunwapta Falls Rocky Mountain Lodge is your ideal place to make your connection with nature and create your vacation memories. The Mount Robson Inn is located at the south end of Jasper’s Main Street. This is an ideal location in the town of Jasper, Alberta as it is quieter, yet only a short walk to downtown amidst the Canadian Rockies backdrop. 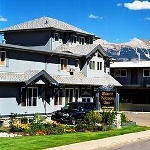 The family approach to being a preferred accommodation in Jasper is to ensure that each hotel guest is taken care of as if they were in their own home. There is no better way to experience the Canadian Rockies than to stay at Johnston Canyon Resort. Johnston Canyon Resort is adjacent to one of the highest scenic value and most famous set of waterfalls in Banff National Park. 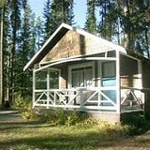 The location of Johnston Canyon Resort cabins offers an unforgettable Canadian Rockies vacation experience. Our 42 classic cabin rentals, situated just off the scenic Bow Valley Parkway, the number 1 attraction in Banff National Park, bring you in touch with nature while providing a refreshing and rejuvenating experience. 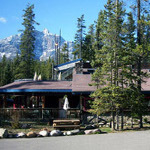 The Mountaineer Lodge, open year round, is one of the best and most affordable places to stay in the Lake Louise area of Canada’s Rocky Mountains. 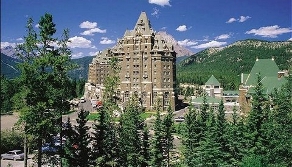 Our well-appointed hotel accommodations are surrounded by some of the most famous peaks in the Canadian Rockies. The Mountaineer Lodge is nestled in a pine forest with tremendous views of Mount Temple and its summit glacier. The Lodge has the feel of mountain seclusion yet is easily accessed from the Trans Canada Highway and is a scenic 5 minute walk from a variety of services and shopping in the village of Lake Louise, Alberta.